Ende des 13. Jahrhunderts errichtet Thomas de Clare an Stelle einer Kirche eine Normannenburg, die aber bereits wenige Jahrzehnte später erobert und zerstört wurde. Mitte des 14. Jahrhunderts wurde eine Kirche auf den Resten der Burg gebaut, die knapp 100 Jahre später durch die Klosterkirche des vom MacNamara Clan gegründeten Franziskanerklosters ersetzt wurde. Mitte des 16.Jahrhundert wurde das Kloster unter König Heinrich VIII. geschlossen, aber gegen Ende des Jahrhunderts wieder vom MacNamara Clan restauriert. Mitte des 17. Jahrhunderts besuchten etwa 800 Schüler das College des Klosters. Nach der Zerstörung durch Oliver Cromwell (1651) wurde das Kloster zwar wieder aufgebaut, aber nur mehr wenige Mönche lebten hier bis zum Tod des letzten Bruders zu Beginn des 19. Jahrhunderts. At the end of the 13th century Thomas de Clare built a Norman castle on the place of a church, which however was conquered and destroyed only a few decades later. In the middle of the 14th century a church was built on top of the remains of the castle, not even 100 years later it was replaced by the minster of the Franciscan friary founded by the MacNamara clan. In the middle of the 16th century the friary was closed under King Henry VIII, but restored at the end of the century again by the MacNamara clan. 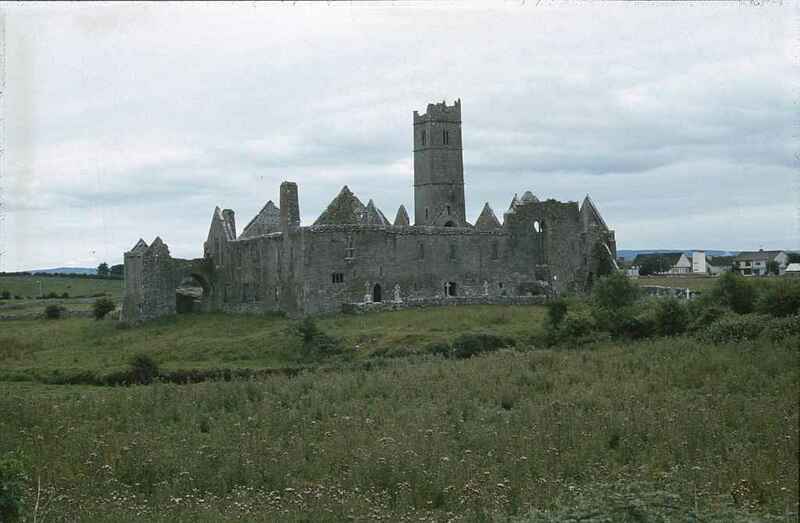 In the middle of the 17th century about 800 students attended to the college of the friary. After the destruction by Oliver Cromwell (1651) the friary was rebuilt again, but only a few monks lived here until the last one died at the beginning of the 19th century.